Irrespective of the elegance and price of a saree, it is incomplete without the perfect blouse. A blouse is the core most essence of a saree and, no saree can ever be perfect without a good, well-fitted and trending blouse. 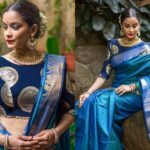 Most women put a lot of effort into finding a good saree; however, it is important to understand that it is the blouse that plays a major role than the saree itself. 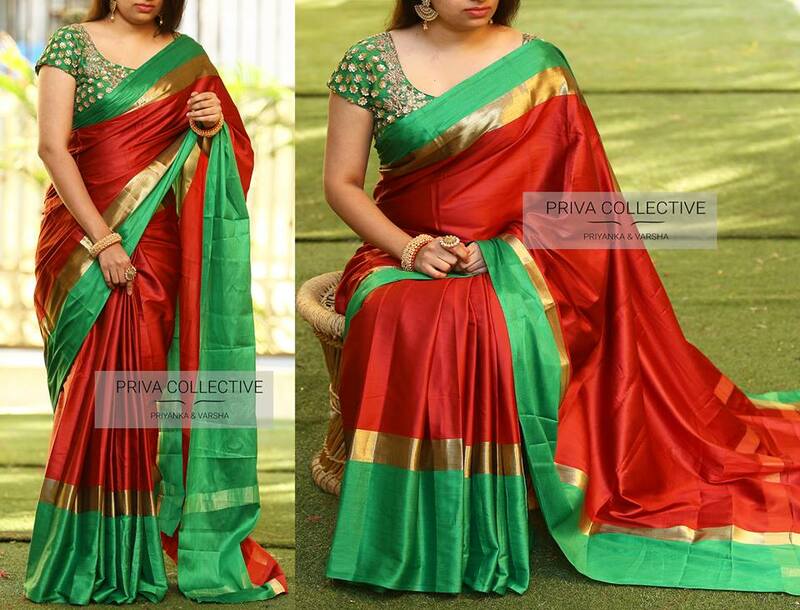 Heavy sarees go perfectly with a simple blouse whereas; the simplest sarees need a heavy blouse to complete the look. The look, design, cut, shape, fitting, etc. of a blouse are the primary key of a good blouse. It is very important to have the right blouse especially if you’re looking to drape a basic saree. 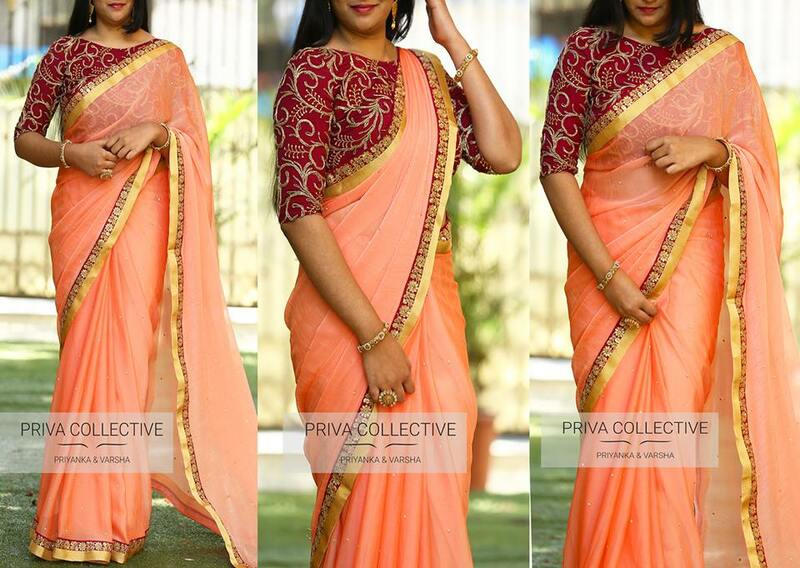 A heavy blouse is perfect for a plain saree and is a must if you want to catch everyone’s attention. 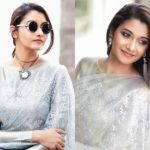 To help you pick up a perfect heavy blouse and sink into the ongoing trend, below are some of the best heavy blouses to pair with a plain saree. 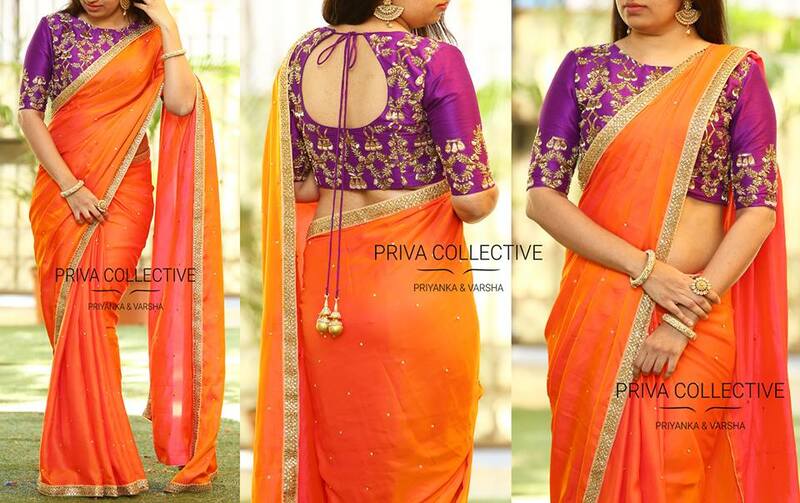 To shop the sarees and blouses from the brand, contact details are given at the end of the post. A simple yet heavy bicolored blouse which matches the saree’s border is perfect for any mild occasion. The intricate detailing of the blouse has great importance and can give a good look without the need of much accessorizing. The color combination too is perfect and can be matched easily. This blouse is perfect if you are looking for a monochromatic look. It is neither too bold nor too simple. It is the best pick if you simply want to blend into an occasion without much pump. The monotonous look is a just the right choice for a mild occasion. Floral pattern in the form of a maggam work is just the right choice for any saree. It evidently adds a great new level to the attire and can be paired with a contrasting saree too. It gives a simple yet elegant look and is perfect for any occasion. Contrasting colors that complement each other are always attractive and steal the attention. The work on the blouse matches the color of the saree and hence gives a completing look overall. The simplistic yet heavy look of the blouse is easy to carry around. If you want to try something bold, this is the look for you. Although the blouse is not too heavy, the pattern and the print make it look heavy. It goes great with perfectly stark colors and is a great choice for understated look. The buttoned look on the back neck adds a more sophisticated look. A simplistic blouse with a studded design is perfect for any saree. The back of the blouse is perfect for a bold look. The blouse has a colorful pattern and the simple border of the blouse is simply perfect. The material of the blouse is responsible for making it look quite royal. Net blouses are a lot in trend recently and become even better with intricate detailing on them. The monochromatic look is perfect for any occasion and the net gives that need oomph here. The etched studs add a very intimating feel and are extremely beautiful. This is one of the most classic heavy blouses. The contrasting color combination sets the attire apart. The detailing on the blouse is simple yet elegant and gives a royal look. The lined embroidery adds quite a special, unmatched look. Golden floral studs are a traditional look of heavy blouses. They go perfect with any color combination and can bring the attire to a whole new level. It adds a sense of sophistication and elegance. The border can be worked around with, to give a more outgoing look. Since studded blouses are very much in trend, why not pair it up with beautiful white pearls? This is one of the latest heavy blouse models that is perfect for any formal occasion and can steal attention without putting in much effort. Heavy blouses are not always about embroidery or studs. In this case, the blouse is perfect just by minimalistic designs. 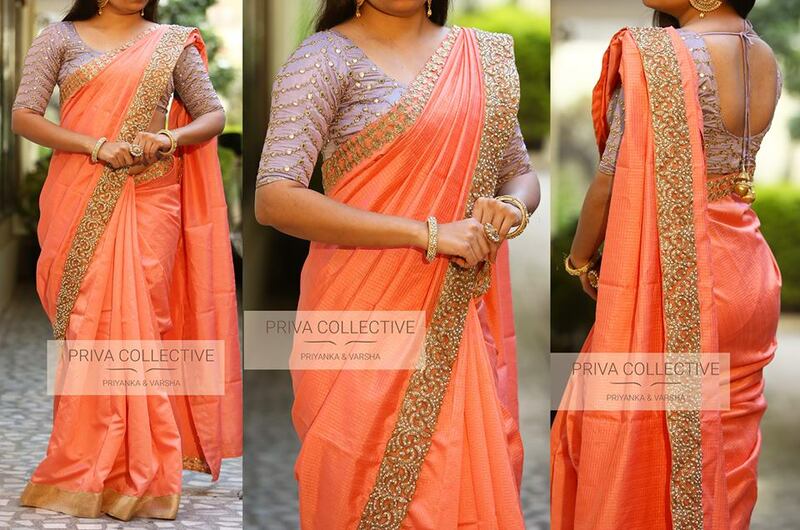 The granite pattern saree adds a completely flawless touch and the pair is just seamless. Although simple, the combination is perfect for almost any occasion. Floral intricate detailing on a blouse is always the best go-to. It can save your attire and is perfect for any occasion. The blouse is elegant and gives a sophisticated feel. It can be paired up with a simple saree and you’re all set to go. A blouse need not necessarily have heavy embroidery. A heavy border and an even more heavy back neck can make the look perfectly complete. Since a back is all that is visible in a sleeveless blouse, a heavy back looks quite stunning. It suits all sarees and makes up a perfect fitting. We all know cold shoulders are the latest in trend. This blouse mixes the modern trend perfectly with ethnic traditionalism. It is simple yet exquisitely heavy. 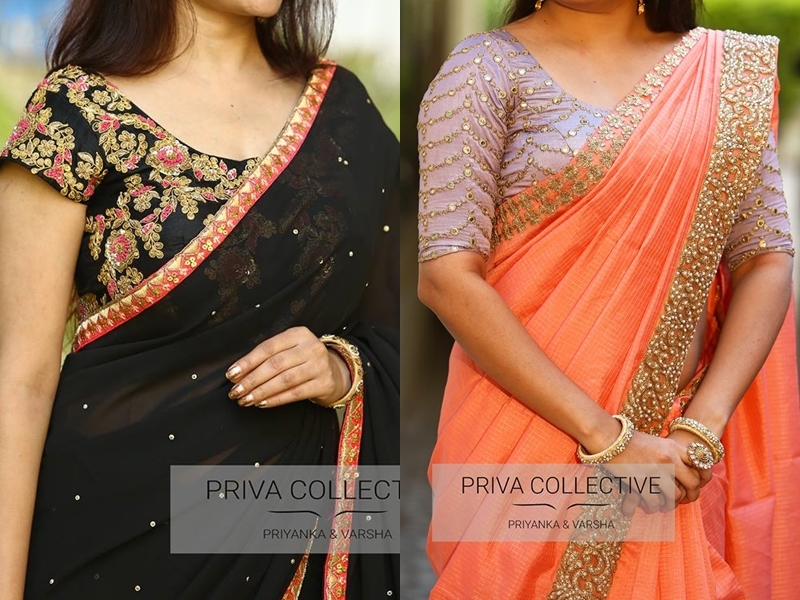 It can be paired up with both simple as well as heavy sarees equally well. A patterned blouse is always perfect for any saree. It gives a completely refined look and makes the attire perfect for a formal outing. The simplistic look is quite sophisticated and can be great even without much accessorizing. A full sleeved golden glittery blouse is definitely a must-have. It is one of the most basic blouses that one must definitely need at some occasion or other. It can lift up the entire attire and can steal the attention of all those around you. It is perfect for a glam-sham occasion and hence, is definitely a must-have. The perfect blouse is always a great need for any occasion. A heavy blouse can steal anyone’s attention and is a mandatory need in any woman’s wardrobe. 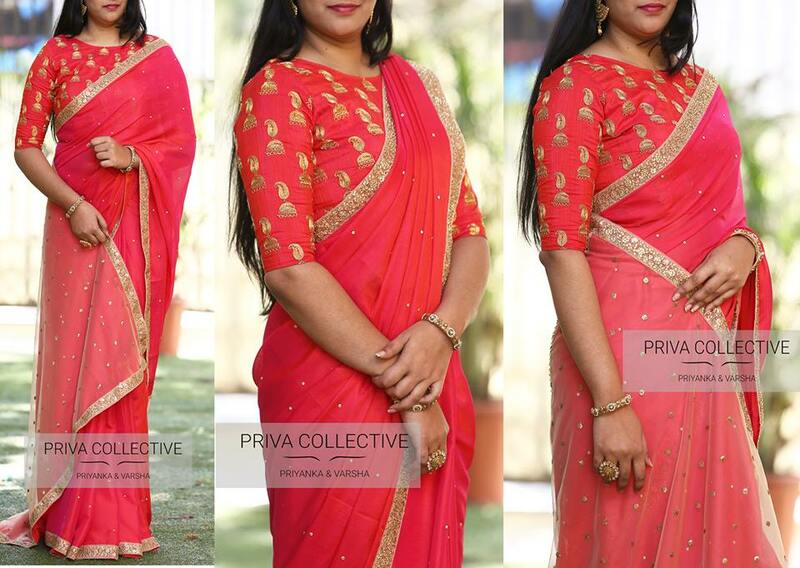 A beautiful saree needs a well tailored blouse no matter what. So go on, pick your choice and drape that dream saree that you’ve been waiting to try out for a memorable occasion. If you like to shop the above sarees and blouses, do check the label below. They have much more amazing collections to shop.